The number one way to differentiate your business is to be the expert. The majority of people will pay more for something if there is additional value attached to it, like professional expert installation or follow-up technical service. The more you know and can convey to your customers, the more important your expertise becomes. What's the Difference Between Indirect and Direct Field Sound Masking? Speech privacy and sound masking are a rapidly growing category in the commerical AV market. If you are researching sound masking you may have seen the terms direct field and indirect field masking systems. How do you know which is right for your facilty? The good news is AtlasIED can not only explain the difference but also has solutions for both applications. AtlasIED communication systems, unlike many other systems using pre-recorded messages, utilize messages recorded by actual people. These two vocalists are celebrities in their own rights, appearing in over 200 locations world wide and being heard by more than one billion people every year. Learn more about these instantly recognizable vocal celebrities. Audio/video media drives the business world today. Whether you are running a restaurant or a retail store, successful businesses are leveraging business music as a medium to create an experience that attracts and retains customers while also improving employee satisfaction. 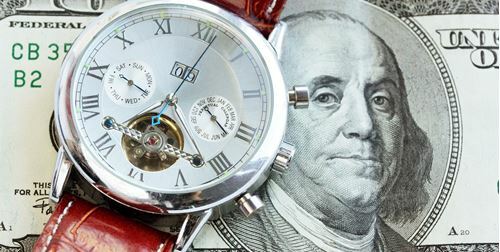 If Time Is Money, How Can I Save and Make More? Time is arguably the most valuable commodity in the world. It never seems like we have enough time for work, family, and other things we want to do. Time is increasingly important to integrators, as any speed that can be gained during a system installation is bonus time for the integrator. Where can integrators save time? How Can I Protect My Horns From LF Damage? Horn speakers and compression drivers have been around forever. They are incredibly reliable, cost-effective, and can cover wide areas for voice, tone and public address applications. Horn speakers and compression drivers benefit when using filtering that protect the compression driver from lower frequencies while making them highly efficient. Once I Pick My Speakers Where Do I Put Them? Speaker placement is one of the fastest ways to take a sound system from sounding great to you have to be kidding. Selecting the right speaker is only the first part of the job, getting it positioned to maximize its efficacy is just as important. Where should you start? Let AtlasIED help out. One of the easiest and most cost-effective methods to address the quite hospital is speech privacy technology. Speech privacy technology electronically introduces a steady, constant sound that masks unwanted noise created by conversations, equipment, and the normal operation of a hospital. Choosing the right amplifier can be the difference between having a great sounding system and one that doesn't live up to a client's expectations. With so many options in the market, how do you choose the right amplifier for your application? 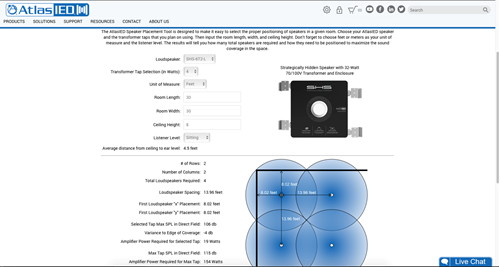 Read more for some general rules to help ensure you get the right amplifier to complete your installation properly. Unified Communications (UC) is a popular form of collaborative communications for all business types that leverages todays converged networks. UC can include many forms of communication including instant messaging (chat), voice (IP telephony), mobile convergence, visual signaling, and more, that enables the same notification to be pushed across multiple devices thereby breaking the distance barriers that are characteristic of traditional analog systems. The best solution for today's collaborative office environments to reduce distractions is a quality Speech Privacy Solution, often also referred to as a sound masking system or a white noise system. AtlasIED speech privacy technologies pleasantly raise the ambient sound level in the environment by emitting acoustically optimized white or pink masking noise. Safety Listings are specific standards that products are required to meet for given applications and uses. These include everything in a building from the electrical system to the plumbing as well as the loudspeakers, wiring, electronics, and racks used to support the paging, BGM, or emergency communication systems. Few systems are as misunderstood as "70V" systems. The most important trait of these systems is the use of transformers that are used to "step down" the signal voltage before applying it to the loudspeaker. This is necessary because the signal voltage is "stepped up" at the amplifier. Myths regarding these systems abound. Some are rooted in fact, others, not so much. These are some common misconceptions about 70V loudspeaker systems. 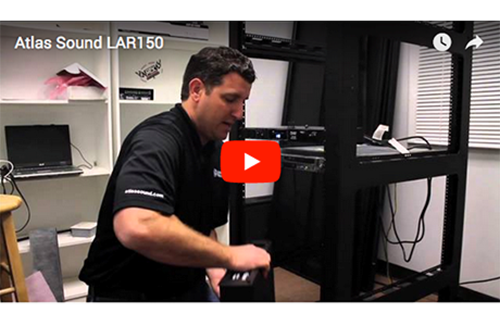 The RAPID System is an online tool that allows an integrator or end user to select the rack type and height that is best suited for their job and then load it with all of the necessary components to put their system together. Have you ever struggled to hold a 50lb amplifier with one arm while you try to hold a mounting screw on the end of your screwdriver, and line up the holes on the rack rails with the mounting ears of the amplifier all while you hope you don't strip the threads? Or better yet, have you ever dropped a heavy rack component onto other components in the rack when you were trying to take it out? WHY?